After the supply voltage has been connected, a three-second initialisation period follows. Provided the PTC chain resistance is below the reset threshold(2.95KΩ), the relay trips after these 3 seconds have expired. The SE-E1 can monitor up to nine PTC thermistors even with differing rated shut-off temperatures. If one or more PTC thermistors become highly resistive, the motor protector switches off. After cooling down below the reset threshold, a 5-minute delay period begins. When this period has expired, the relay trips again, provided all PTCs are below the reset threshold. If a second PTC error is detected within 24 hours of the first, the delay period is 60 minutes. If a third PTC error occurs within the 24-hour period, the relay switches off and locks. The monitoring of the three-phase motor voltage becomes active 1 second after the motor has started, for a time window of 10 seconds. In case of a wrong phase sequence or a phase failure, the relay switches off and locks. After the motor is shut off, the phase monitoring is inactive for 20 seconds to avoid an unintended shut off by a motor that possibly may be rotating in reverse. 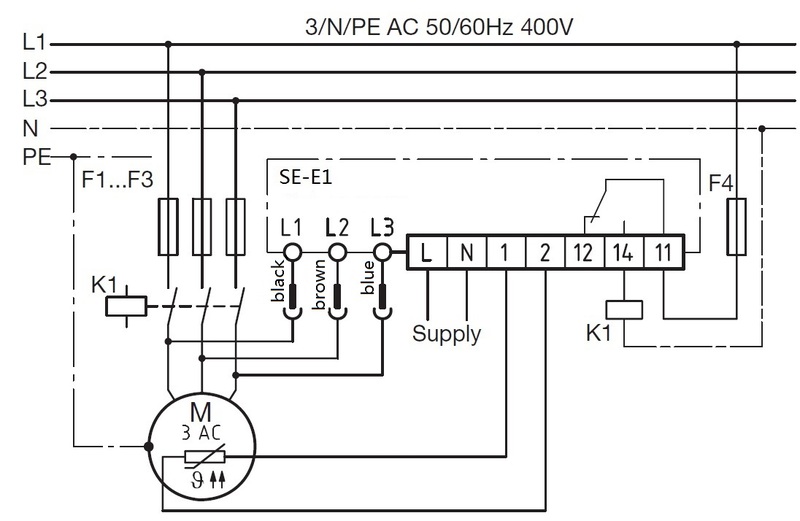 The lock-out and delay can be removed by a mains reset(>5s). The SE-E1 is not suitable for use with frequency converters.